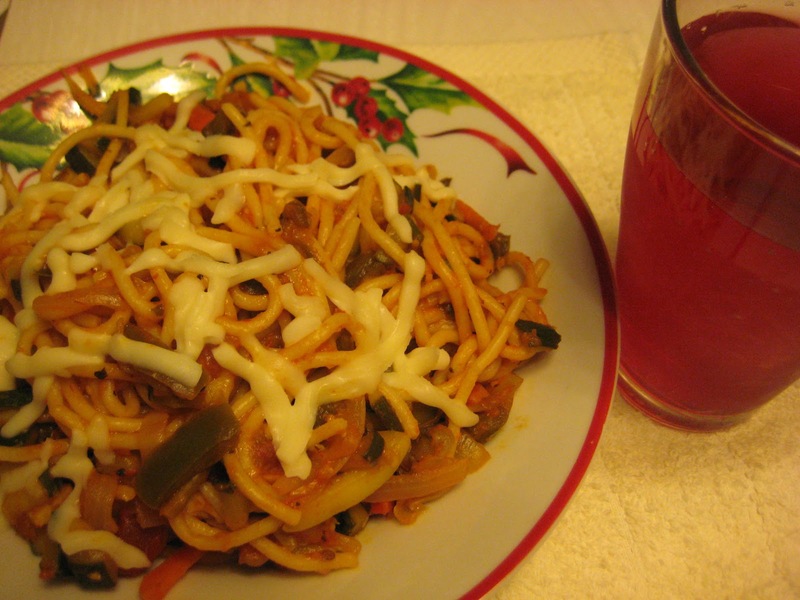 Hello friends, here is a recipe for Noodles lovers.I do not know weather its an Italian style dish, I just followed some steps present on the Spaghetti packet and added some ingredients which I like most to prepare to my taste( say Indo-Italian style ;)). I used Mozzarella cheese as I dint have Parmesan.I just sprinkled the grated cheese and microwaved for 40 sec.Give it a try and let me know how you liked it..Enjoy. Heat 2 lts of water in a large pan.As water starts boiling add 2 tsp of Salt and Pasta noodles.Cook the Noodles for 10-12 min or until tender. Heat 2 tsp Oil in a pan, add Onion, chopped green Chilies and minced Garlic, saute for 30 sec.Then add the chopped zucchini, Carrot and Bell Pepper.Adjust the salt if needed.Saute for 3-4 min. Now add Pasta sauce, Sugar OR Tomato ketchup and Oregano.Saute for a min. 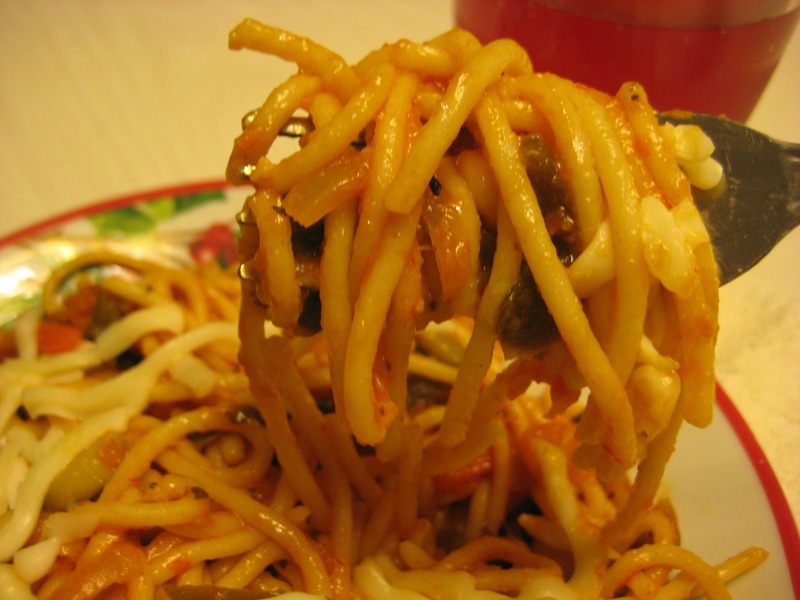 Add cooked pasta Noodles, gently mix OR just toss until mixed. 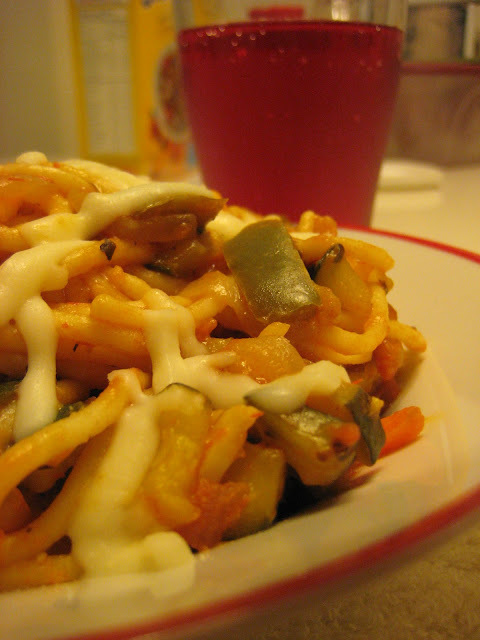 Finally sprinkle Parmesan cheese and serve hot.